This special concert includes note-for-note transcriptions recreating such famous George Shearing Quintet’s signature jazz arrangements as “September In The Rain,” “Lullaby of Birdland,” “I’ll Remember April,” and more. Our historic hall will reverberate as the Quintet plays new arrangements in the Shearing style, adventurous jazz pieces, and presents anecdotes and historical musical notes about the legendary group. 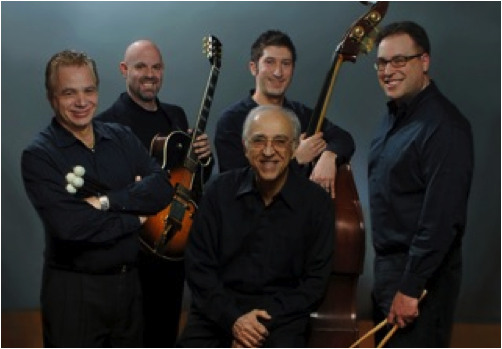 The Argiro Quintet members are James Argiro, piano; Rich Goldstein, guitar; Mario DeCiutiis, vibraphone; Jason Schwartz, bass; Clark Seibold, drums; and vocalist, Andrea Niki. Collectively, the extensive list of renowned jazz artists with which members have performed includes: Mulgrew Miller, Eddie Henderson, Joe Wilder, Branford Marsalis, Anthony Braxton, Houston Person, Mel Torme, Marlena Shaw, Ernie Andrews, Lionel Hampton, “Cat” Anderson, Red Rodney, Ernie Watts, Jeff Hamilton, Shelly Manne and Louis Bellson. These collective musical experiences find their expression in the group’s strong identity, where a playful interaction is always present. The Argiro Quintet and their original music are also an integral part of the movie, Chasing Rainbows, starring Swedish actress, Kristi Torhaug. Released in 2015, it has won many awards including The Global Music Award’s Bronze Medal for the musical score, created by Argiro and author, Robert Fritz.